So after a bumpy (travel) start (when our car broke down in Central France and was beyond economical repair) to my altitude training camp we arrived in Font Romeu and the sun was shining, the altitude air was fresh and the forests were just as I had left them in the spring. My first run was on one of my favourite trails and Lola the Whippet remembered it well and little Ella, her new sister, was in her element scamping about through the trees. Font Romeu is a beautiful place to visit, I just love running here, there is something about waking up to that spectacular view of the Pyrenees mountains (usually capped with white snow like a dusting of icing sugar), heading out and feeling the sunshine on your back and the smell of the pine trees wafting through the fresh thin air as you zip through the extensive trails this place has to offer. All that running at Altitude makes you very hungry. Most of you now know that I love my food and I can put away quite a lot, lol. People, especially younger athletes, always ask me about my diet and I always tell them the truth – I never deprive myself of the little “treats” in life, everything in moderation and a little bit of what you love never hurts you, as long as you have put the work in then you deserve a little reward. Wonder will Santa ever bring me one of these – In my dreams!!! Rose-Anne & I get a lesson in Barista from ‘Patrick’ the barman in Pub le Dahu! Training gets tough up here and one of the most important meals of the day is breakfast, we have a ritual of getting the coffee machine on first, even before the dogs are walked (they are lazy wee things in the mornings) and making a massive bowl of porridge with the works! My favourite porridge combo includes a teaspoon of peanut butter swirled in with some flax seeds and some fresh raspberries on top. On long run or session days I will also have a yoghurt with some musli on top and an SOS is a must in my water in the mornings to make sure I’m hydrated for the session. 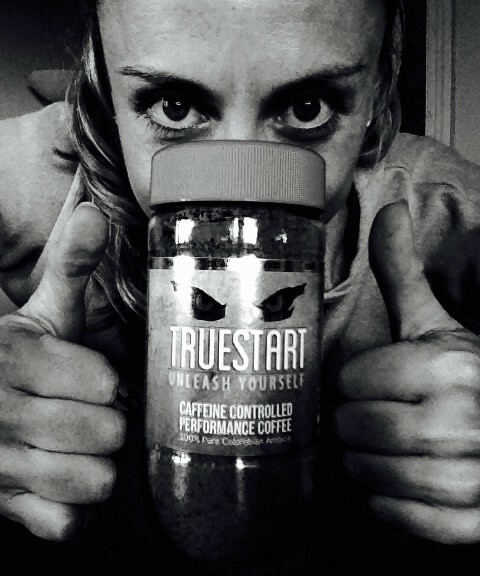 Fuelling up on TrueStart coffee before my afternoon run. Whilst out here training hard a new company, TrueStart, sent Rose-Anne and I some instant coffee. Now I’m a real coffee snob and if you flip back to my Beijing Blog you will read that Kelly Proper and I even bought a coffee machine for our rooms whilst out there at the World Champs! TrueStart coffee is the first performance coffee which is caffeine controlled to come onto the market. It arrived one afternoon here in Font Romeu and we tried it straight away before our evening run. We enjoyed the flavour and were impressed at the pick up it gave us for the run, you can get very tired out here and some afternoons/evenings it is hard to get back out there and get that little bit of extra mileage in. TrueStart coffee is great when we have been in a rush to training and want that instant boost, it will be very good to take on training camps and to competitions as they also do little handy sachets. TrueStart meets Font Romeu forests. So we have been here now for just over 3 weeks, with another 2 to go and an international cross-county in Burgos (roughly half way between Bilbao and Madrid) to race over along the way. Our favourite place to session is a grassy 1km loop at Matemal Lake, its great for tempo, fartlek and endurance sessions and we can have our SOSrehydrate on hand in between reps. The weather has been fabulous for training with only a few cold days and thankfully no snow this time round- yet…lol! 1km loop at Matemale, coach Rodgers gave me a lovely 6x1km session with only 90sec recovery on this one!!! My 3 training partners and I at the lake. 25degrees on 7th Nov!!!! The time is flying by here and we will soon be making the journey back to Ireland (in my left hand drive car) for the National Cross-County (European Cross-Country trials) which we are looking forward to. After the race we will have to take the car to the garage to get the headlamps changed along with a few other bits and pieces so that it can be driven legally and safe on the other side of the road. I didn’t think about that until the car insurance people mentioned it to Richard! Anyway a little more hassle than we were expecting but sure it’s all part of the ‘Road to Rio’ story and maybe makes for a bit more interesting of a read…lol. Rose-Anne and I are delighted to announce that we are now Ambassadors for Team TrueStart Coffee, so keep an eye out on Twitter, Facebook and Instagram for when Team TrueStart will be visiting your nearest health store for some free samples and promos – it’s just been launched in Ireland. TrueStart Ambassadors at Altitude in Font Romeu. We never get sick of that view behind us of the Pyrenees! Your Glutes – Are they Firing????? Warm Weather Training – What’s All the Fuss About?